Boudicca's Battle Cry: Fart Head of the Week! To take a little liberty from my beloved Andy Cohen @BravoAndy, who hosts the Bravo show Watch What Happens Live, JackHole of the week, mine is FartHead of the week. And the first recipient of that distinction is drum-roll please, Debbie Russell. First, let us get one thing straight I am a MAJOR democrat, I am an advocate of the bullied and against bullies in whatever pleasant guise, they dwell and I am an equal opportunity hater. Debbie Russell is in her own words calls herself an Activist Organizer Hellraiser. What I call her is a bully and a white washed sepulcher! On Saturday the day after the murder of a cherished cop, Jaime Padron a man, who I myself had many conversations with and teased every time I saw him at the bodega. This was a lovely, humble man whom I DID NOT DETECT A HINT OF AN EGO, he had a delightful bright smile and a warmth that emanated from him. 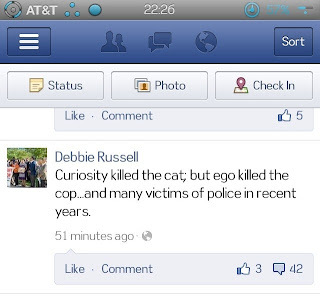 The comments she made on her Facebook page were unconscionable, I am so glad I did not see them the, she wrote on her Facebook page, “Curiosity killed the cat; but ego killed the cop…and may victims of in recent years.” are you kidding, it's people like you who believe they must commit word vomit to call attention to how outrageous you are. Ego did not kill the cop, a drunken moron with a gun did. Normal people would wait a bit to let some facts regarding a situation to come to light, not you, you had the unmitigated entitled effrontery to write those more than thoughtless words, it was an affront to every person on the planet who ever needed help! In a city of, according to the 2010 Census Data was, 790,390 we have 2300 policemen and policewomen to protect and serve us, do the math, I did 1 cop for every 344 persons! They do the best they can in situations that would have you crying like the baby that you undoubtedly are Debbie Russell! Yep, you whiny entitled little girl who should be ashamed of herself for entering those foul words into your phone. I am an equal opportunity hater, I do not have a preference one way or another, I call it like I see it and your words pissed me off! Grow up and I hope you never need a cop, oh, wait, except here’s the rub, they would even come for you in you needed them you whiny brat! You then, when it got a little too hot apologized for your comment however, it was no different than Rush Limbaugh's insinsere apology for calling women whores, guess what, just as lame! Apology here! How do you think would you explain the comment to the two little girls who lost their father on Good Friday.